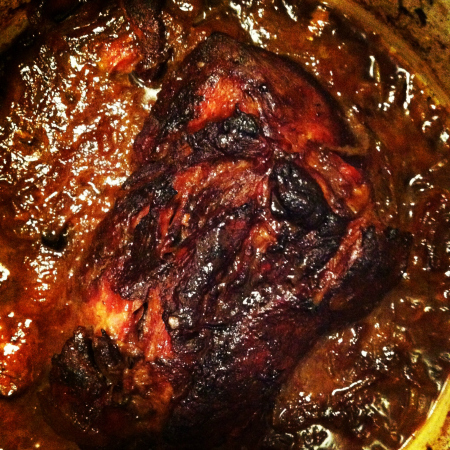 Another Instagram dinner for you – this tasty Asian-style slow-cooked pork. It’s flavoured with five spice, ginger, soy and rhubarb and is delicious in rice paper rolls, with noodles, salads or sandwiches. Preheat the oven to 150°C (conventional). Heat the oil in a large, heavy-based saucepan over high heat. Brown the pork for 1-2 minutes each side. Add the remaining ingredients and bring to the boil. Cover with a lid and cook in the oven for 3 hours. Remove the lid and cook for a further 1 hour, or until the sauce is reduced and the meat is so tender you can pull it apart with a fork. Remove the ginger, onion skins and coriander root. Taste the sauce and season with a little more brown sugar or soy if required. Use two forks to shred the meat into chunks and stir through the sauce. Serves 4-6 depending on what you have it with. oOo We had the pork in rice paper rolls with bean sprouts, mint, red onion, cucumber and carrot. These were dipped in chilli sauce. oOo I also added it to a stir-fried kale and eggplant rice noodle dish which was delicious. oOo You can freeze the pork and sauce in an airtight container or snaplock bag for up to 3 months. Oh my God, that looks amazing!! I can practically taste it. 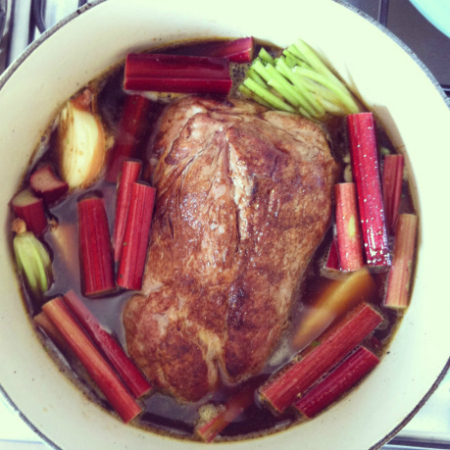 Rhubarb in a savoury dish, that’s different! Will definitely try making it. Yes it adds a tart flavour which is really nice with the rich pork. Let me know if you try it!